A 501c3 nonprofit driven to educate girls 6th – 12th grade in S.T.E.M. Founded in 1992, Women In Technology (WIT) serves as a passionate advocate for women and girls at every stage of their STEM careers – from the classroom to the boardroom. WIT utilizes its programs, connections, volunteer opportunities and events to enable the development of the WIT community through recognition, thought leadership and foundation efforts. WIT is driven to help women and girls write their own stories of success throughout the full lifecycle of their careers and continued evolution as STEM leaders. A group of professional women produce workshops, and career panels to answer questions young girls face when making decisions about their education. Careers Exploration workshops focus on girls in middle and high school to ignite their interest in STEM careers and to assist them in crafting educational roadmaps and career plans to pursue STEM employment opportunities. 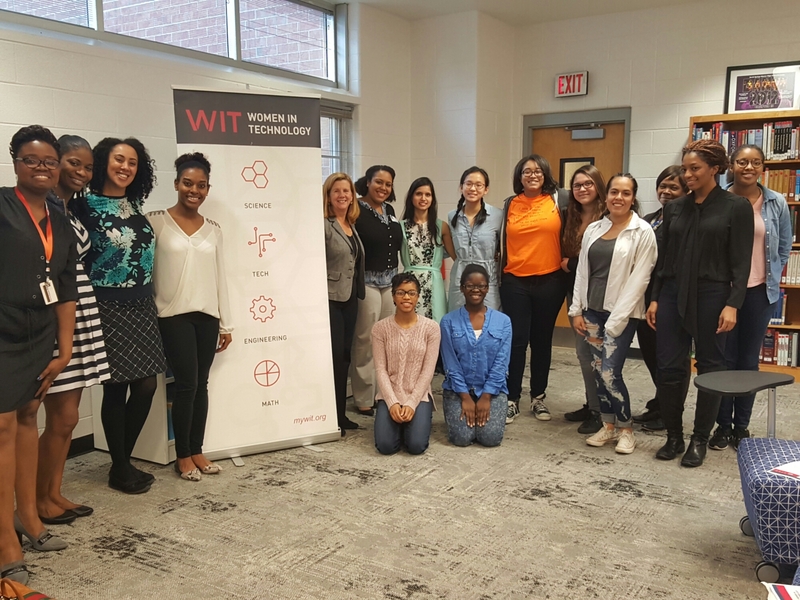 On Thursday, March 9, 2017 WIT Careers Exploration Team hosted a S.T.E.M career panel of female engineers to share their worklife journey, experiences and outcome with a high school S.T.E.M club at North Springs Charter High School in Sandy Springs, GA.
As a volunteer program manager of WIT, it provides our team another opportunity to serve the need of the *SPARK* S.T.E.M program vision to educate, initiate and innovate young minds of tomorrow in grades 6th – 12th in S.T.E.M education and research with the help of professional women in S.T.E.M careers or education and Women In Technology to discuss advantage and disadvantages of female leaders statistics in S.T.E.M, worklife balance, growth opportunities, challenging obstacles, lessons learned, and strategic planning dispite their life circumstances or situations with the target of underserved communities across cultures.